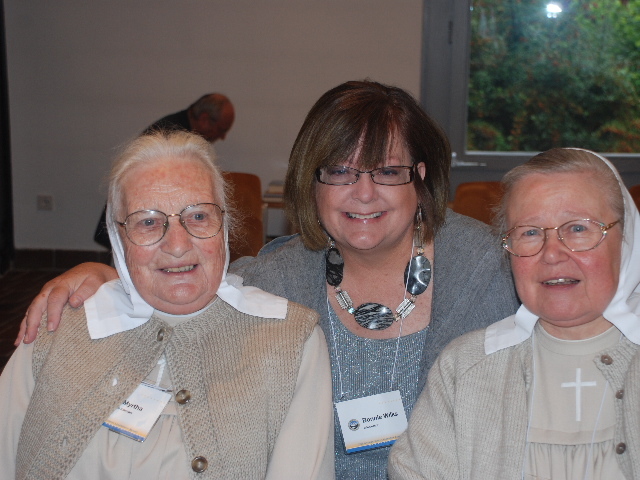 These two sisters from the Evangelical Sisterhood of Mary located in Darmstadt, Germany, are attending the Toward Jerusalem Council II prayer initiative this week. Their story of reconciliation between Gentile and Jew and the Jew and the Church started with World War II and continues until today. The founder of their community and movement is Basilia Schlink. You can read the whole story here about the wonderful gift of love and compassion that they offer those who suffered in the Holocaust. As a young person seeking to serve God with my utmost, I was profoundly drawn to their movement. They were known then more as the Sisters of Canaan. I thought about becoming one! These sisters have traveled the world asking Jews to forgive Germany for the sins of the Holocaust. Wherever they go, people’s lives are changed by their sincere repentance, their humility, and their hearts of service. It was such a privilege to meet these two sisters this week, to spend sometime getting to know their experiences, and just hanging around them. They are definitely two of my heroes in life! I, too, wanted to become one of them! When I was a teenager I SO wanted to go to Kanaan in Darmstadt and model my life after Basilea Schlink. I have many of her books. Her life and the life of the sisters there inspire me like none other. I yearn for the simplicity and devotion that they have. Life in the States is way too complicated. Some day, Abba willing, I’m going there. Thanks for the post! I’ve read and have been blessed by Sister Schlink throughout the years. I too would love to know more about them. Can you e-mail me? Also, information on The Evangelical Sisterhood. Thank you.